Davis loves math. And she has some strong feelings about the way people perceive math. Do mathematics researchers spend all day hunched over calculators? Absolutely not. What does it mean to do an experiment in mathematics? Davis says it's all about shapes. In fact, the research Davis does contributes to a field that could help us understand the shape of the entire universe. Does the universe have an edge? Or is it more like one of those weird Pentagon things in the video? Tune in and find out. It's time for (arguably) the best holiday of the year: Halloween. Children will be out trick-or-treating tomorrow, and kids of all ages will don their most inspired (or last minute, thrown together) costumes as well. Costumes I've seen so far have covered a lot of ground: superheroes, mimes, Mega Sharks, and even binders (for political humor). But one costume department sorely lacks representation: physics costumes. 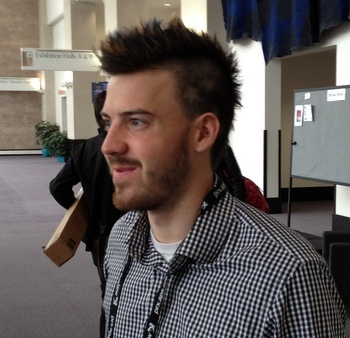 To help boost physics' Halloween cred, I will be "NASA Mohawk Guy" for Halloween this year. Bobak Ferdowsi -- the NASA Mohawk Guy -- achieved fairly widespread Internet fame during the landing of the Mars Curiosity Rover in August. David Ruffner wasn't thinking about tractor beams-- until NASA called. Last year, a team of researchers at NASA set out to work with scientists to develop a beam of light that could draw objects back along its length. Affixed to a space-probe, the tractor beam would remotely collect extraterrestrial atmospheric and planetary particles and transport them back to the space-probe for analysis. Now, scientists at New York University have put science-fiction into practice with a device that can pull particles of sand, plastic, and even molecules and cells up a conveyor belt of light. overlaying a real image of the system. Big, big astronomy news announced last week: a new planet has been discovered orbiting one of our closest stellar neighbors. A mere 4.4 light years away, Alpha Centauri Bb is both the closest and smallest extra-solar planet yet discovered. And while the planet is too hot to support life, it's presence suggests there may be other, Earth-size planets in the same system—possibly in the habitable zone. To learn more about the new planet, how it was found, and plans to find more planets in the Alpha Centauri system, check out this week's podcast. Alpha Centauri Bb orbits around the star Alpha Centauri B, a member of the three-star Alpha Centauri system. The two brightest stars in the system, Alpha Centauri A and Alpha Centauri B, are similar to our sun. These two stars exist in a binary system, meaning they orbit very closet together, around a common central point. 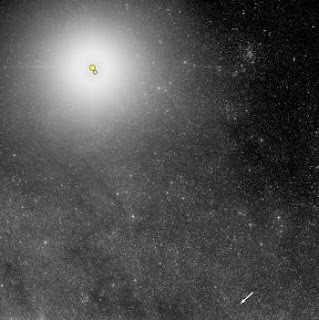 A third star, called Proxima Centauri, orbits in a wide loop around A and B, at a distance of about one trillion miles. Proxima Centauri is a red dwarf: an extremely small, cool, and thus very dim star. Despite being the closest star to our solar system, Proxima Centaur is not visible with the naked eye. In many ways the new planet is unremarkable (it's not a planet made of diamonds as far as we can tell) but it's proximity to our own planet is enough to send the imagination soaring. What if there are planets in the Alpha Centauri system that are the right temperature to host life (why do you need liquid water to support life, anyway?)? What if we developed technologies that allowed a probe to reach the system? The discovery of Alpha Centauri Bb is a landmark on our journey to explore world beyond our own. At the end of their lives, massive stars can rapidly collapse onto their core and explode within a matter of seconds. As matter and particles rush toward the star's center, they pack together extremely tightly until they hit the limits at which nuclear forces flex their muscles. This "bounce" against the nuclear forces leads to the massive explosion and shockwave whose remnants we can see with telescopes. During the bounce, there's some strange physics going on that remains to be fully understood. Many scientists believe that the collapsing nuclei, protons, and neutrons from the star form strange formations during the bounce: nuclear pasta. The particles form spaghetti, meatballs, and lasagna density formations. 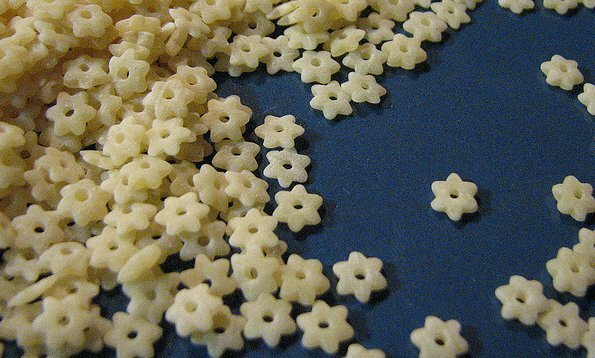 Now, physicists can add a new pasta combination to the mix thanks to new research. Stellini pasta image courtesy add1sun via flickr. Seven people have been convicted of manslaughter in Italy for failing to foretell an earthquake. 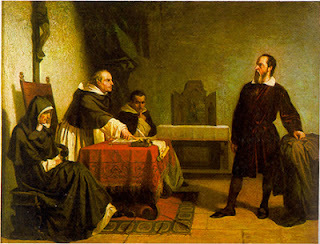 Galileo on trial 400 years ago. 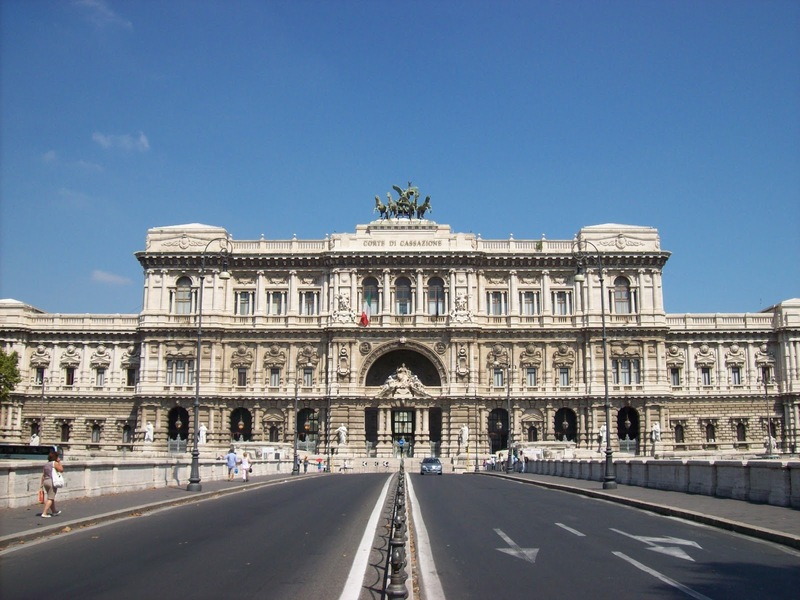 A new case shows that once again, Italian courts don't understand science. It's alright to enjoy a good Tarot reading from time to time. If you prefer palm readers, tea leaves, or goat entrails (wait, scratch the entrails part) then that's your business. Just realize it's entertainment, not science. A California Federal judge has ruled that General Motors didn't violate copyright rules by using Einstein's image in an advertisement. 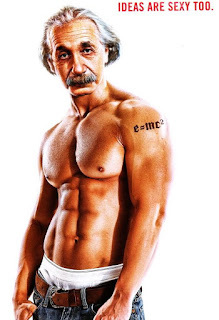 Einstein as depicted in a 2009 GMC Terrain ad. In keeping with the wishes in Einstein's will, the Hebrew University of Jerusalem owned rights to nearly all of his images. The University collected fees for the use of pictures in ads and other materials, and denied permission in cases the University deemed inappropriate. The image here is from an ad that General Motors placed in People Magazine in 2009. Unsurprisingly, the Hebrew University took GM to court in 2010 seeking compensation for the unauthorized, and highly modified, picture. In a ruling released today, the judge in the case determined that the rights to Einstein's image expired in 2010, fifty-five years after his death in New Jersey back in 1955, and that the lawsuit was initiated too late for the University to recoup any damages. Incidentally, had Einstein passed away in California, the copyright would still stand because the state allows heirs to maintain their rights up to seventy years after death. The more significant point is that now, at least according to California courts, anyone can use Einstein's face in any way they like. This is in stark contrast to previous years when the Hebrew University was able to rigorously enforce their copyrights on a vast array of things related to Einstein. What is the deal with the legal system in Italy? A new ruling by the Italian Supreme Court has found, despite the lack of credible scientific evidence or even a plausible mechanism, that cell phones cause brain tumors. 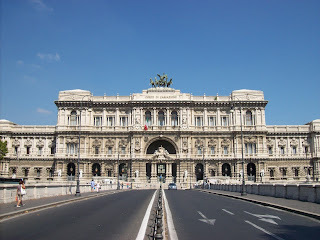 The last time we mentioned Italian courts on this blog, it was in discussing the attempt to prosecute seismologists who failed to predict an unpredictable earthquake. And of course, there was the famous trial of the scientist (and pioneer of the modern scientific method) who had the audacity to argue that the Earth is not the center of the universe - Galileo Galilei. It's a good thing half of CERN is in Italy. At least that offsets their silly science track record a good bit. 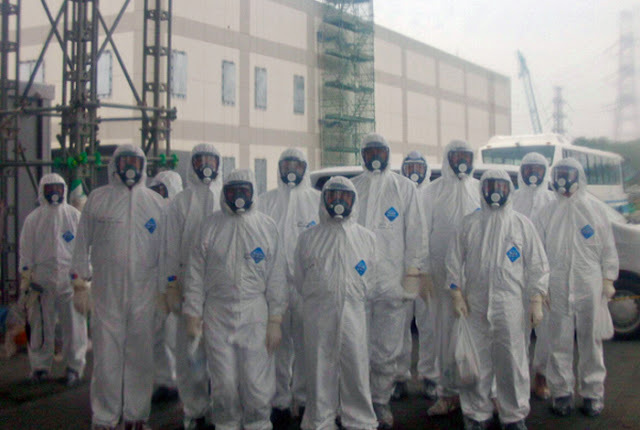 Cosmic Rays Might Offer Japan Much Needed Aid in Nuclear Power Plant Cleanup. On March 11, 2011 a wave almost 100 feet high rose out of a magnitude 9 earthquake centered close to the coast of Japan. As the ground shook in one of the wost earthquakes of the century, the nuclear reactors at the Fukushima Dai-ichi Nuclear Power Plant initiated emergency shutdown: stop fission, turn on backup generators to cool reactors as the heat of radioactive decay gradually abates. And then the water hit. The generators were destroyed as the tsunami's flood of 40 foot waves washed over the plant. Without the cool water pumped by the generators, heat and pressure inside the reactors continued to build to a series of hydrogen explosions and a nuclear meltdown that damaged three of the plant's six reactors. at the Fukushima Dai-ichi Nuclear Power Plant. Courtesy of Los Alamos National Laboratory. For the past two years, Japan has been trudging through the environmental, health, and safety cleanup but the high radiation levels have prevented anyone from getting close enough to inspect the damage inside the reactors. Now, researchers suggest that cosmic-rays, once used to scour the pyramids of Egypt and search beneath active volcanoes, could expose new information about the damaged reactors. In this week's podcast, I took a look at the work of Serge Haroche and David Wineland, this year's winners of the Physics Nobel Prize. They won for their groundbreaking work into quantum optics, the study of the interaction of light and matter at the smallest scales. 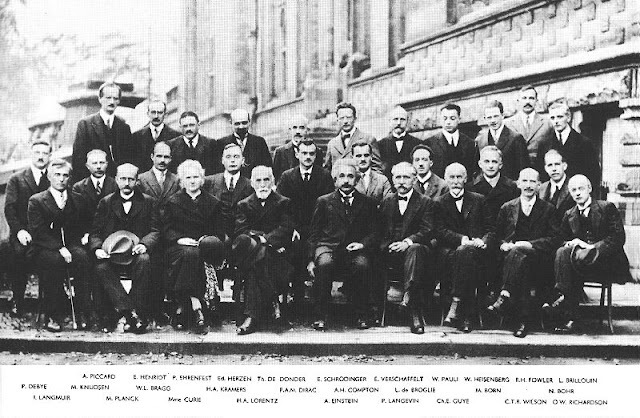 Moreover, together their research let scientists play with the confounding world of quantum mechanics at a level once thought impossible. In January, a few months before he won the most prestigious award in science, Wineland sat down with people at the Institute for Quantum Computing to talk a little more in depth about his research into ion traps, quantum weirdness and what you can do with it all. Typically, when a droplet of water plunges into a pool of water, it will bounce slightly and then coalesce with the rest of the water. But there's a way to keep the bounce going indefinitely. According to a common story (which may be a sort of physics folk tale as far as I know) the physicist Christiaan Huygens was sick in bed idly watching a pair of pendulum clocks on his wall when he noticed that they were swinging in perfect harmony (anti-harmony actually, because they swung in opposite directions, like mirror images of each other). When he set them swinging out of sync, they would always manage to eventually adjust their periods until they were swinging perfectly together again. Although Huygens never figured out exactly what was going on, we now know that the two pendulums were coupled through tiny motions transferred through the wall they were both attached to. It's too bad Huygens never thought to do an experiment like the one in the video here. If you have a little over four minutes to kill, check it out. I'm sure this demo would have totally blown Huygen's mind. I think it's just cool. In this week's podcast we talk to author and science historian Robert Marc Freedman*, one of the foremost authorities on the science Nobel Prizes awarded prior to 1950 (specifically, Friedman studied the members of the award committee and tried to understand how the award winners were selected). We also talk briefly with Martin Perl**, co-winner of the 1995 Nobel Prize in physics for his discovery of the tau lepton. I got in touch with Dr. Friedman with what I thought was a simple question: why are the Nobel Prizes such a big deal? There is quite simply no other science prize that comes close. But what did the Nobels do to earn this status? Serge Haroche and David Wineland were honored today with the 2012 Nobel Prize in Physics, for inventing the tools through which scientists can observe as the rules of quantum mechanics governing individual particles give rise to those of the classical world. Simulated image of ions in a quantum superposition state. Source: NIST / Bill Pietsch, Astronaut 3 Media Group, Inc. The work of the two physicists are dazzlingly complementary. 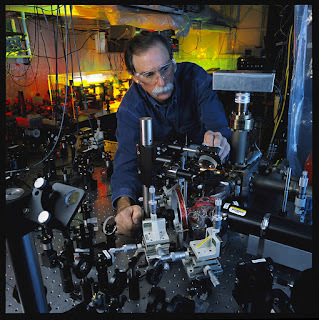 Wineland and his colleagues at the National Institute of Standards and Technology at the University of Colorado have devised systems of trapping single electrically charged atoms, called ions, to study quantum phenomena using pulses of laser light. Halfway across the world, Haroche and his team at the Collège de France in Paris Ecole Normale Supérieure have developed a superconducting container that can trap a single photon and, using a carefully timed stream of atoms, gather unprecedented information about the photon's quantum state. Serge Haroche and David J. Winerland win the 2012 Nobel Prize “for ground-breaking experimental methods that enable measuring and manipulation of individual quantum systems". COLLEGE PARK, MD – The 2012 Nobel Prize for Physics has been awarded to two physicists who performed experiments exploring aspects of quantum mechanics of particles and photons. Serge Haroche of the Collège de France has focused primarily on trapping photons and studying their interactions with atoms, while David Wineland of the National Institute of Standards and Technology (NIST) in Boulder, CO studies the quantum mechanics of atoms trapped and manipulated with lasers. The prize-winning work is crucial to studying and confirming the often counter-intuitive nature of quantum mechanical systems. The experiments the two physicists performed lay the foundation for technology allowing the construction of quantum computers, which could solve problems far beyond the capabilities of even the most advanced conventional computers. 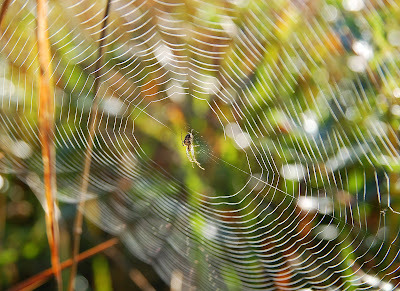 Modern, ultra-precise clocks rely on the techniques developed by Haroche, Wineland and other scientists working on the forefront of quantum mechanical experimentation. Both Haroche and Wineland are Fellows of the American Physical Society. Wineland has also won two of the APS prestigious prizes: the 2001 Schawlow Prize in Laser Science, and the 1990 Davisson-Germer Prize in Atomic or Surface Physics. Across the globe, a handful of individuals will be woken from sleep or stopped in their tracks while crossing a busy street as they are interrupted from their otherwise ordinary day with a phone call from the Nobel Prize committee. Over the next week, the Royal Swedish Academy of Sciences will announce this year's Nobel Prize winners. 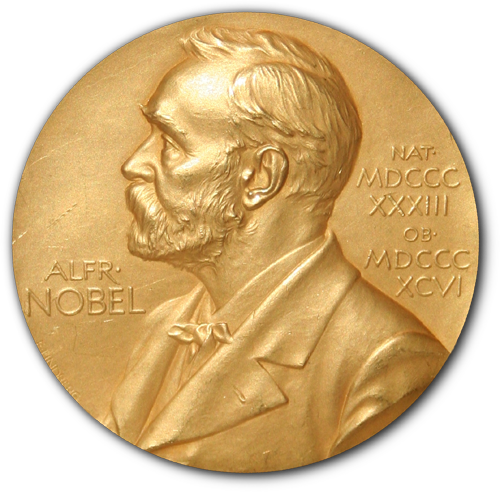 Awarded in accordance with the will of Alfred Nobel, the prizes will go "to those who, during the preceding year, shall have conferred the greatest benefit to mankind," through their advances in the disciplines of medicine or physiology, physics, chemistry, literature, and peace. For those of us not expecting the free trip to Sweden, the Nobels are a great opportunity to catch up on the science behind some of the top inventions and discoveries contending for the prize in physics. Since the early 20th century, physicists have been twisting their heads around the gedankenexperiment (thought experiments) of the quantum world. Unlike the macroscopic world, Newton's laws of motion and Maxwell's laws of classical electromagnetism do not accurately predict behavior on the microscopic scale of atoms or electrons. At the start of the 20th century, these inconsistencies were the subject of heated and lively debates between physicists the likes of Einstein, Bohr, Sommerfeld, Dirac, Curie, Heisenberg, Pauli, Bose, and Schrodinger, culminating in the theories of quantum mechanics at the Fifth Solvay Conference in 1927. It's no coincidence that our eyes are adapted to see visible light. Our sun radiates most of its light in the visible range; if our eyes adapted to almost any other wavelength, our days would be much darker. And yet, visible light only represents a small fraction of all the light in the universe. Modern astronomy has allowed us to see the cosmos in every wavelength from radio waves to gamma rays, and has revealed a far more dynamic universe than our eyes could ever see unaided. This week on the Physics Buzz podcast, we'll take a brief tour of the universe, via the electromagnetic spectrum. And, we'll touch on some important questions about light. Like what does it mean for light to have a wavelength? If light is a wave, where do photons fit in? What exactly is the electromagnetic spectrum? 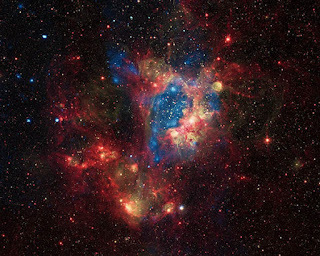 The above image shows star cluster NGC 192 in X-ray, infrared and ultraviolet light, courtesy of images collected by three different telescopes. An amazing NASA resource for learning about the electromagnetic spectrum and what each wavelength has to offer. The Cool Cosmos multi-wavelength site is SO COOL! Seriously, check out side-by-side images of planets, galaxies, and more universal objects in multiple wavelengths. And, learn about how scientists study the cosmos in different wavelengths. Nothing puts a skip in your brisk autumnal step like the the announcement of the 2012 MacArthur 'genius' Fellows, which provides an inspiring and concise account of twenty-three veritably brilliant individuals working on daring and creative projects from filmmaking to neurobiology to instrument bow-making. 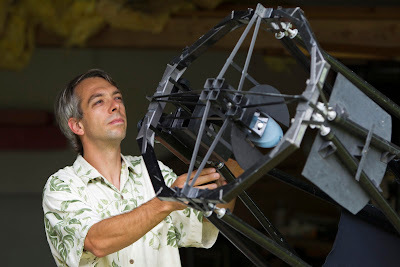 In the excitement of the moment, I'd like to highlight one of this year's MacArthur Fellows, Olivier Guyon, an astronomer and optical physicist who has proposed a cool investment of some of his no-strings-attached MacArthur grant: crowdsourcing the planet hunt. Image courtesy of The John D. & Catherine T. MacArthur Foundation. Quark Twain here, thrilled to join the Physics Buzz blog team as the new APS science writing intern. I hail from New York City via Swarthmore College where I enjoyed four years playing music and ultimate frisbee while studying Physics and English literature in the odd hours. 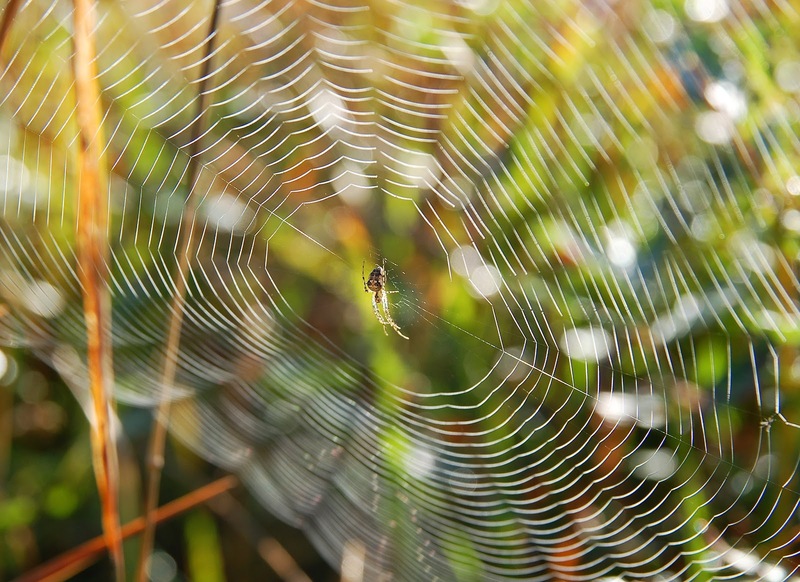 Before landing at the Physics Buzz, I wrote about the proteins guarding the circadian rhythm and boa constrictor viruses among other hot biomedical research findings for the Bulletin and News at the Howard Hughes Medical Institute. 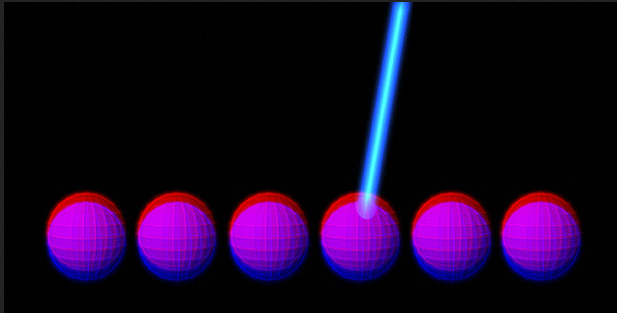 Shooting lasers at nanodiamonds to study electron spins flippy-flopping. Building a super-resolution microscope to take pretty pictures. Vaporizing iron and silicon with an electron beam to create new materials for quantum computing. 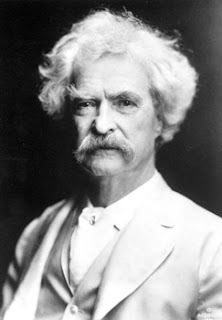 Image courtesy of The Mark Twain House and Museum.